This past Sunday we celebrated the baptism of Renee Colette. It was a beautiful event and we were blessed to have the support of many of our family and friends who joined us. Unfortunately Renee's Godfather Dale was unable to make it up from Texas, but Jan stood in for Dale along with Renee's Godmother Vicki. 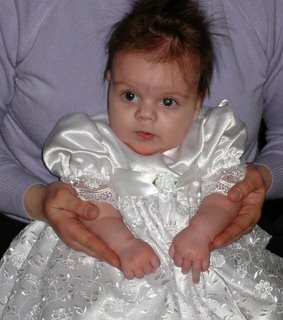 Nana, Grandma and Papa were also unable to make it in town for the baptism, but Grandma made the gorgeous baptism gown worn by Renee. Thanks to everyone for keeping us in your thoughts and prayers on this holy day. charge over you, to guide you in all your ways." Winter has finally arrived here in Northern New Jersey. 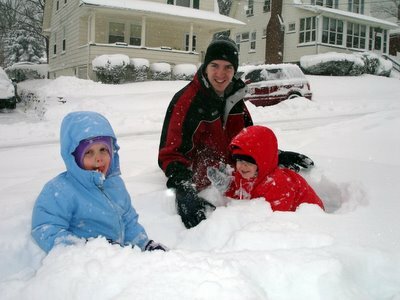 After several month of very mild winter, we finally got a taste of winter this weekend with a huge Noreaster. The final total was over 26 inches and the Turkeys loved it all. We made a sled run in the back yard and Emma made snow angels while Andy ate the snow. The didn't want to come inside even with red rosy cheaks and ice cold fingers. 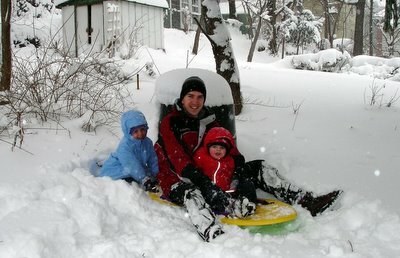 Check out Flickr for all of our blizzard photos.